At the Geneva Motor Show, Ferrari unveiled its flagship supercar, elegantly titled LaFerrari. It's a beast of a machine sporting almost 1,000 horsepower. 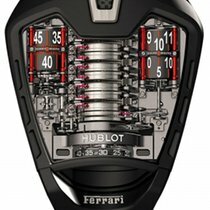 The Hublot MP-05 LaFerrari was created as a tribute to the LaFerrari, with the Hublot engineers having designed, developed, and produced the timepiece in parallel with the car. The face is made from sapphire crystal, shaped to be reminiscent of the car's outline. The case and buckle are crafted from black PVD titanium, with the strap being made from rubber. A total of 637 components power the movement of the watch, which is a record for Hublot. The MP-05 LaFerrari features a 50-day power reserve, which is a world record for a hand-wound Tourbillon wristwatch  not that you're expected to wind it up with your hand, as a miniature power drill does the job for you. There are 11 series-coupled barrels set in a spine formation down the center of the watch, which work together to keep the watch turning for up to seven weeks at a time. There are cylinders to the left and right of the center barrel. Those to the left indicate the amount of power remaining, with those on the right used to tell the time. Reinforcing bars are placed either side of the cylinders, with the red used being another nod to Ferrari. Only 50 of these limited-edition watches are being made, making it more exclusive than the LaFerrari car itself, of which there will be 499 made.